Washington (CNN) - After their second caucus meeting of the day, House Republicans decided not to attempt the process of amending the scaled back fiscal cliff deal, and instead bring the Senate proposal to an up-or-down vote on the House floor. The vote is expected to take place between 11:15 and 11:45 p.m. ET, according to House Republican leaders. Republican leadership had been counting votes on an amendment to the Senate measure that would add $300 billion in spending cuts. They would have need 217 votes to add the amendment. For the cliff to be avoided, then, the next step would have been for the Senate to consider the version amended by the House. 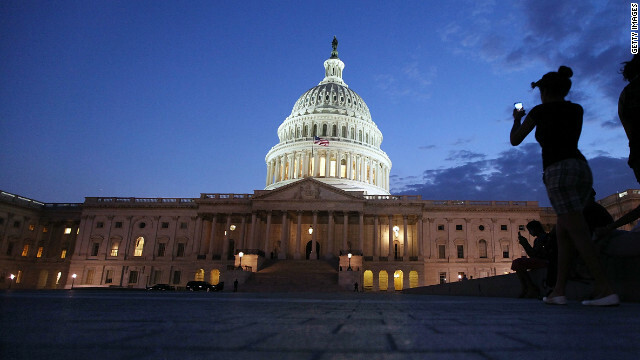 But the Senate has adjourned until midday Wednesday - after the market opens and 24 hours from the swearing in of the new Congress on Thursday. House Republicans' concern was that the Senate would not take up the amended bill, and the GOP tactic would backfire politically. Rep. John Fleming, R-Louisiana, said to try to amend "what really is a bad bill, it probably would just frustrate many people." "It's one of those things where an idea pops up that sounds good," he said, describing the mood after Republicans' first conference meeting earlier in the day. "But then you think through and you look at all the ramifications and problems. I think for many of us we look back at the payroll tax thing that happened a year ago and see that when you see a bill pass with so many Republicans in the Senate, it would probably have a similar result," he said. In December 2011, Republicans sought to tie objectives like the Keystone XL oil pipeline to a year-long extension of the payroll tax cut. A number of Republicans said on Tuesday that they would vote against the Senate measure, but those Republicans voting yea would be joined by many Democrats. It passed the Senate 89-8 around 2 a.m. ET Tuesday. If the GOP attached an amendment, it would be an anti abortion plank, and would not do anything to help pay for the unfunded republican wars, the republican tax cuts, and the republican near depression. Obama took the GOP behind the woodshed and gave them an old fashioned whoopin. Fix it some way you are all an embarrassment to the country! Now do your job and get on with it! Changing this bill would be a problem. Any attempt to do so now would essentially kill it. They should have thought of that a few weeks or months ago. I don't like the full thing, but it is better than nothing or what Boehner proposed on his plan B.
YAAAAAAY! the finally figured out that the American people didn't want them to keep obstructing everything. When this is over. We will have the bush tax cuts permanent. And, next will be the revenue from the Ryan plan. The president had already talked about it. Democrats win the emotion. They know the American public is becoming less educated. But plans will still be center right.